Why must we travel and see the earth well beyond our needs? what good comes from pain endured, hard-earned money spent on fleeting moments we cannot take back? Who else other than the traveller remembers or cares about moments on expeditions and pointless walks through a forest? When will the wanderer be at peace? Where is that spot of calm that we set out for, with that organised backpack? what satisfaction exactly is derived from a visual captured on a device to take back as memories? For all the W questions we ask in retrospect, the answer is another set of Ws- We would Wishfully Wander where whereabouts whisk to world’s wonders. So leave behind those irrelevant little nothings that mean so little, especially when you see a picture of this planet from outer space. Why do we hang on to things in this life of .16 seconds? Thank you- Carl Sagan, for putting things in perspective. Dwell not further on pointless posts such as this- concocted in a state of restlessness, itching feet for the next trip to a landscape unseen. Explore, and inspire me. For all the crib of a lack of Industry in Kerala, if there were, would it be God’s own then? A naturally rich state is on the brink of losing its treasure- the flora and fauna we take for granted. 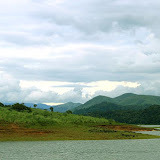 From Thekkady to my back yard- this is the heaven that has become a memory in other, so called ‘developed’ areas. A glimpse at the Pandora that still is.